Are your shoes worn or stretched? Replace shoes and test. Remove any arch support in insoles (see below). Do you feel like you are coming out of the shoe? Wear the orthotic between the hosiery or sock and foot to keep orthotic in proper position. Have your feet suddenly started bothering you in certain shoes? Remove the shoe's insoles and cut out the parts that may be interfering in the proper positioning of the orthotic or replace insole with flat cushioning insole. Do you have the orthotics in the correct shoe? Little dimple always goes to the outside. 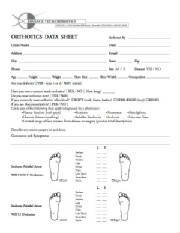 Complete the adjustment form and mail with your orthotics to our lab. Include the $4.95 shipping or see the pricing & order page for credit card form. We have found the USPS priority mail with delivery confirmation to be the least expensive shipping. Try their online shipping at www.usps.com.